With long, sunny days ahead who can argue that summer isn’t everyone’s favourite time of the year? 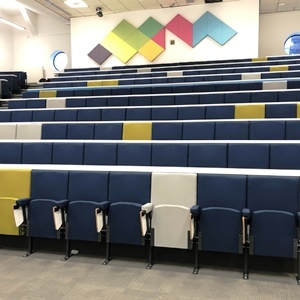 At CPS we embrace this season as it’s our busiest time of the year with regards to installing our seating products into many university campuses up and down the country. CPS Manufacturing Co is the industry specialist in transforming old and tired looking auditoriums and lecture theatres to places where students can feel both inspired and stimulated. We also have the ability and expertise to design, manufacturer and install seating systems into new builds and our knowledgeable team is readily available to help see a project through from concept to completion. With 53 years' experience behind us we are the number one choice for fixed seating systems in the UK and beyond. Many fine examples of our auditorium and lecture theatre seating projects can be viewed in our gallery here. Please do not hesitate to contact Julian Ashmore on 01302 741888 to discuss our quality range of seating systems in more detail. You can also email us your requirements by clicking here.